The effects of soft ferromagnetic material placed nearby the high-Tc Bi-2223 coil is analyzed. Electro-magnetic simulation have been carried out to find the distributions of the magnetic field of the Bi-2223 coil. The used soft ferromagnetic material could change the distribution of the Bi-2223 coil’s magnetic field, and the transport capability of the Bi-2223 coil changes consequently. 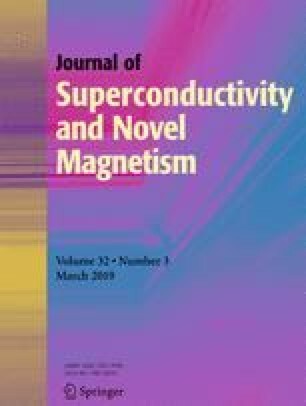 According to the simulation results, the thickness of the soft ferromagnetic material plate shows a notable effect on the coil, and the position and width of the plate could present negative effects. Experimental result of a Bi-2223 coil with B30P105 silicon steel plate is consistent with the simulation conclusions, and the critical current of the developed Bi-2223 coil could achieve an improvement of 15% by using of a piece of silicon steel plate with a thickness of 0.3 mm. This work was supported in part by the National Key R&D Program of China under Grant No. 2017YFB0902301 and China Southern Power Grid under Grant No. 036100KK52160104.